BMTC is planning to set up a counter at Kempegowda Bus Station for selling smart cards by this month end. 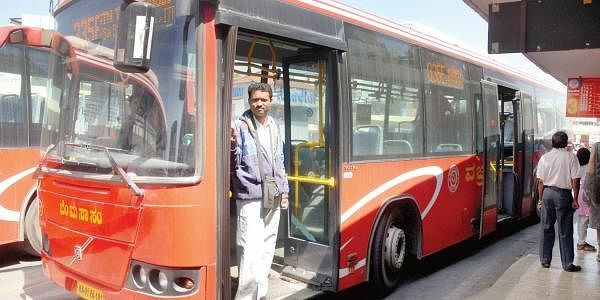 BENGALURU: Cashless bus commute in the city could soon become a reality. BMTC officials told Express that starting March, they are set to launch a smart card facility in AC Volvo buses on 335-E route (Kempegowda Bus Station to Kadugodi) on a pilot basis. This first of its kind cashless facility is likely to be available in all BMTC buses and routes in the city by April. BMTC is planning to set up a counter at Kempegowda Bus Station for selling smart cards by this month end. “This is the first time a state-run transport corporation in the country is launching a cashless facility. We have recently started experimenting with the smart card facility in buses ferrying BMTC staffers,” a senior BMTC official said. In June 2016, BMTC and Axis Bank started the ‘Axis Bank BMTC Smart Card’, which allows cashless payment for passengers by tapping the card on the electronic ticketing machines. It was then decided to make the smart card available from September 2016. However, this got delayed because of various reasons. The proposed BMTC smart card is expected to be a relief for many commuters and conductors in the city. “Most BMTC conductors are reluctant to give change if the amount is less than `5. It’s also difficult to pay them in coins every time. The proposed BMTC smart card will ensure cashless travel,” says Dipika S, a regular BMTC commuter in Koramangala. Many passengers in the city have been demanding that the BMTC launch the smart card facility after `500 and `1,000 notes were demonetised. “BMTC will also be able to track the passenger revenue using the smart card. But this card cannot be used in Metro. We are in talks with BMRCL to come up with a common mobility card by next year,” the BMTC official said. However, BMTC’s smart card will allow passengers to pay for purchases at shops and malls. Commuters will be able to recharge the card at BMTC bus depots, BengaluruOne, Axis Bank ATMs and also online.